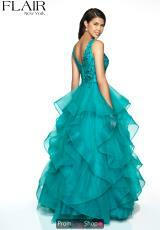 This fabulous Flair prom dress 19052 will ensure you the center of attention. The fitted bodice is adorned in beautiful lace detailing paired with hand beaded embellishments. This stunning style features a plunging neckline and semi open back. To ensure a dramatic entrance, show off the layered tulle skirt as it flows into an a line silhouette.